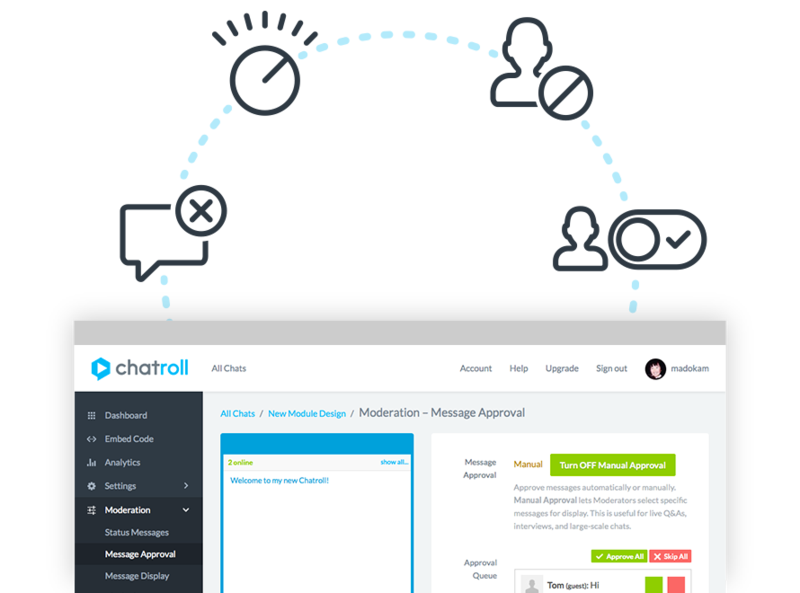 Chatroll™ is the trusted platform for live chat events including webinars, Q&As, information sessions, workshops and more. Audiences today are facing information overload. More than ever, people are blind to traditional ads and static content. So how do you cut through the noise and truly connect? In a world of generic one-way messages, we crave what's real, what's authentic, what's intimate. We crave experiences. Chatroll™ is the original chat platform trusted by entrepreneurs and brands to create engaging live experiences. 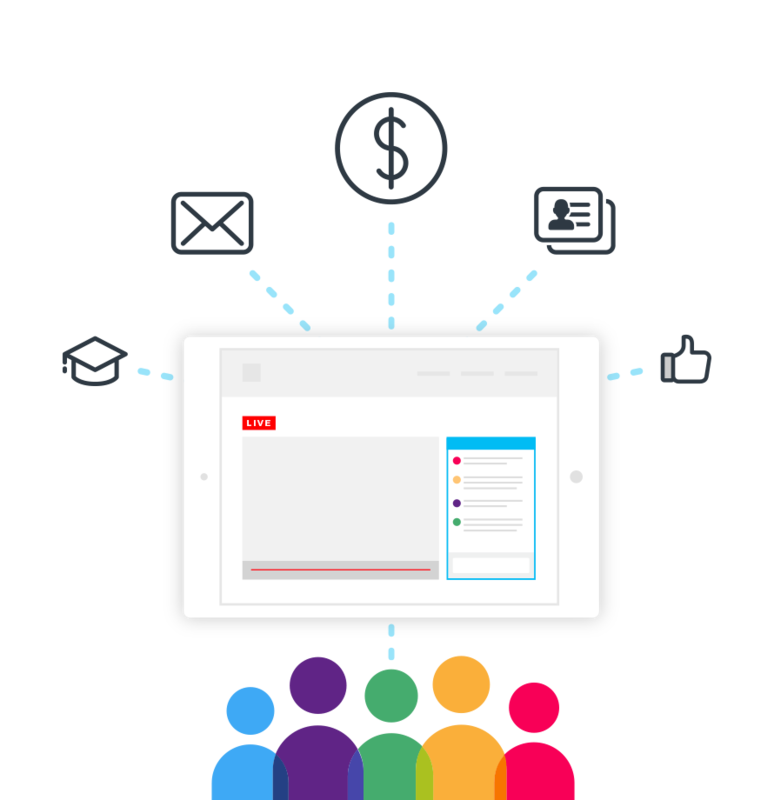 Combining the power of live chat and video, Chatroll gives you the tools you need to create experiences that capture your audience's attention, build trust and engagement, and achieve success. Build a deeper connection with your audience. 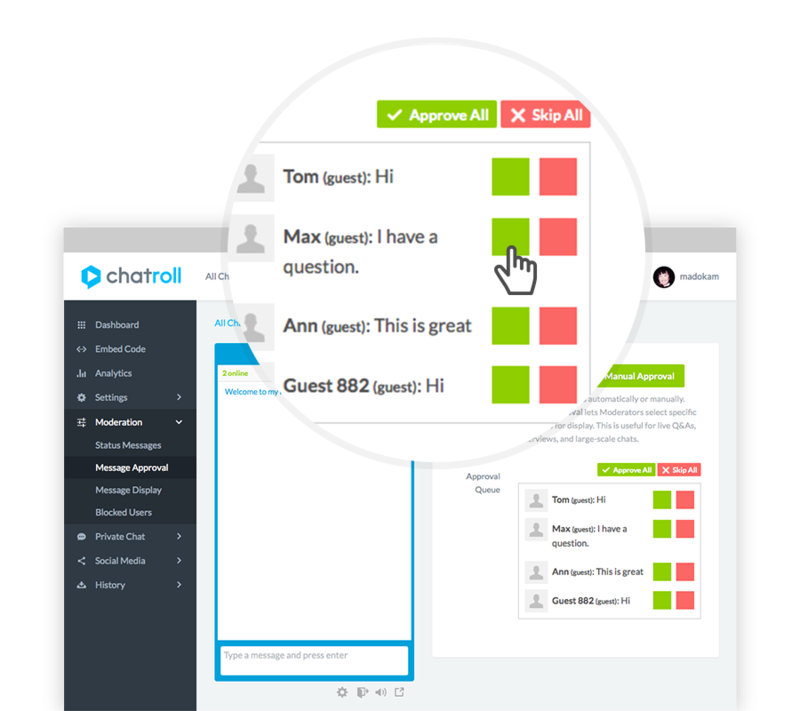 Use Chatroll™ to create live chat events that enable your audience to become active participants who engage with you and with each other. Live chat events enable you to connect with your audience directly, just like being there in person. 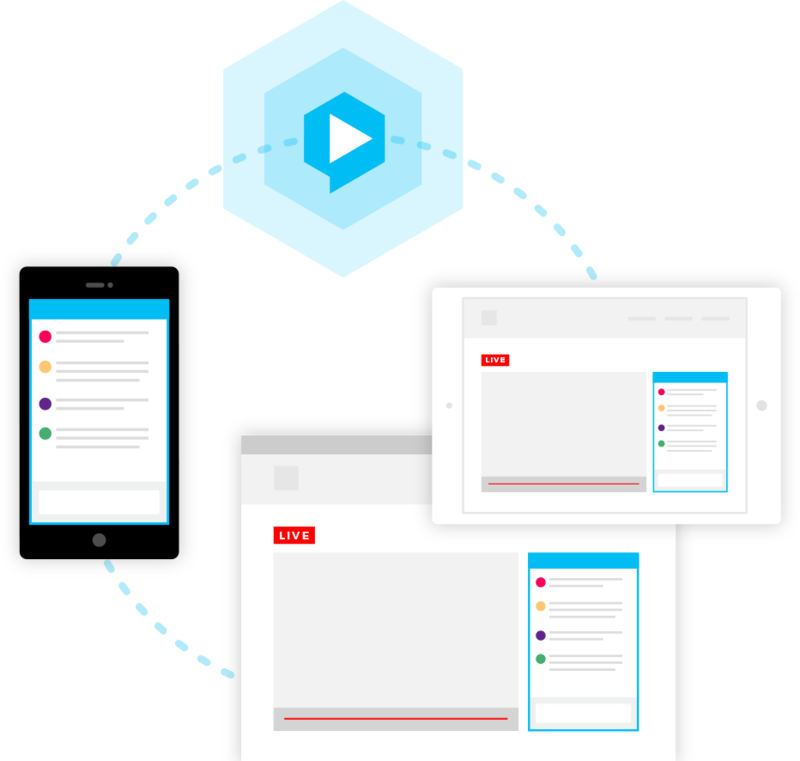 Combine Chatroll with live streaming video to deliver the best possible live experience for your audience. With Chatroll, the possibilities are endless. Online educational, informative, instructional or marketing presentations. Live instructional sessions for virtual teaching and coaching. Question and answer sessions with experts or special guests. Online collaboration on a topic of interest. Live online interviews with subject matter experts and celebrities. Live streamed shows and entertainment. Talk radio, news shows or podcasts with audience participation. Audience interaction for live eSports and fantasy sports. Low-latency real-time interaction for trading and information sharing. Get better results using the power of live chat. Unlike traditional ads or static content, live chat events promote audience engagement, so participants are more likely to respond to what you have to offer. Because Chatroll helps build audience interest and trust, responding to your call-to-action becomes a natural and direct next step. 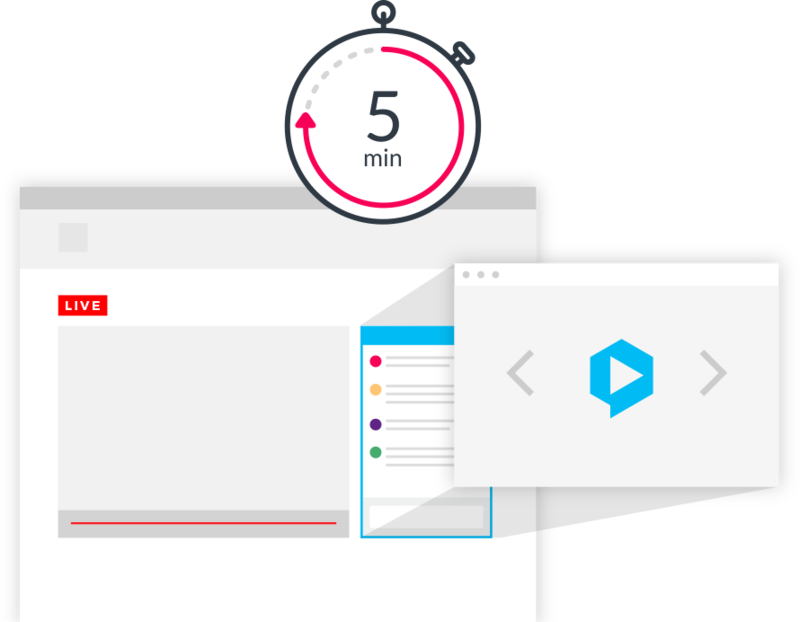 Chatroll improves conversion rates by increasing engagement, and gives you tools to optimize goal conversions while your live event is happening. Sell your product or service when audience interest is peaking - live events are an effective, modern way to drive more conversions. People who gain value from your live events are more likely to request follow-up information via email. Live chat events are a great way to give your audience a taste of the benefits of ongoing membership. Live event attendance demonstrates purchase intent. Live events help you identify, capture and communicate with your highest value leads. Live events help form community around you and your brand by gathering your audience in the same place at the same time to interact. Give your audience the benefit of new knowledge and information in a fun and interactive way. Use live chat events to collect unfiltered feedback about your product or service, directly from your audience. Leverage event attendance and engagement metrics to secure sponsorship opportunities. Offer your audience an exclusive opportunity to access your live events. Create your live event in 5 minutes or less. Chatroll makes live events easy. Your events are configured by default with best practices used by industry leaders, to get you rolling in the right direction from the start. Whether people join your live event on web or mobile, Chatroll just works - there are no apps to download or plugins to install. By providing a frictionless experience, Chatroll removes all barriers to reaching your audience. It's free to sign up, so you can get started with zero risk. Embed your Chatroll event within your existing website or app. Your audience can access your event instantly on web or mobile, with zero downloads. Give your audience a comfortable experience. Choose from a range of login options that best fit your and your audience's needs. 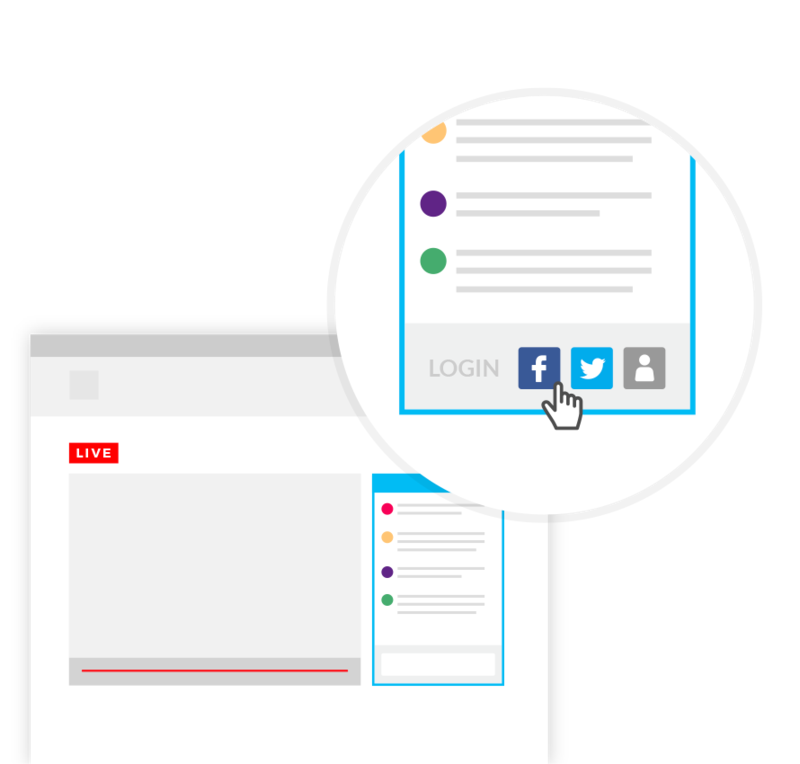 Social Login makes event participation easy for users who already have social network profiles. Guest Login provides extremely low-friction, anonymous access. By giving your audience a choice of login options, they are more likely to engage with your event. A comfortable audience experience leads to greater engagement, and better results. Log in using a Chatroll account. Log in using a Guest account. Log in using a Facebook account. Log in using a Twitter account. Automatically log in users using your site's existing profile system. 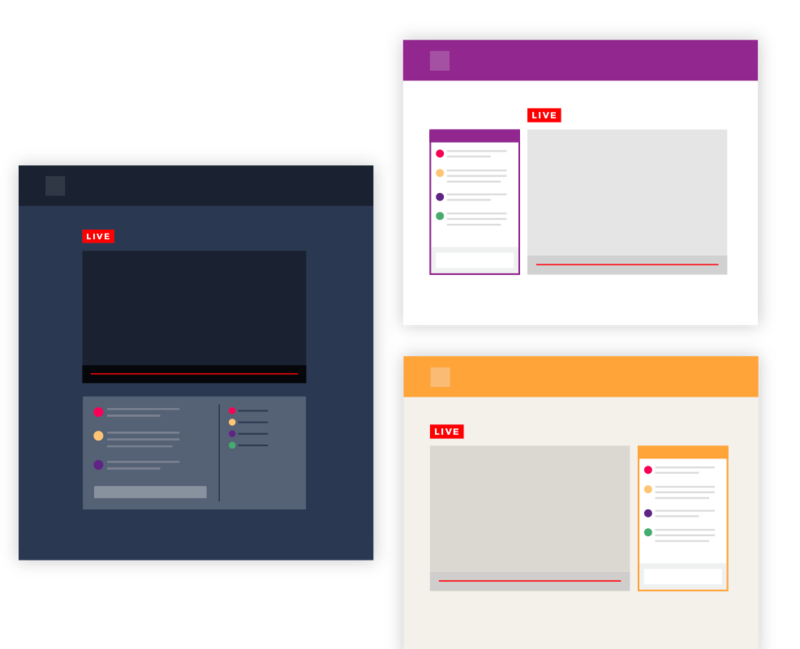 The smart way to combine live chat and video. 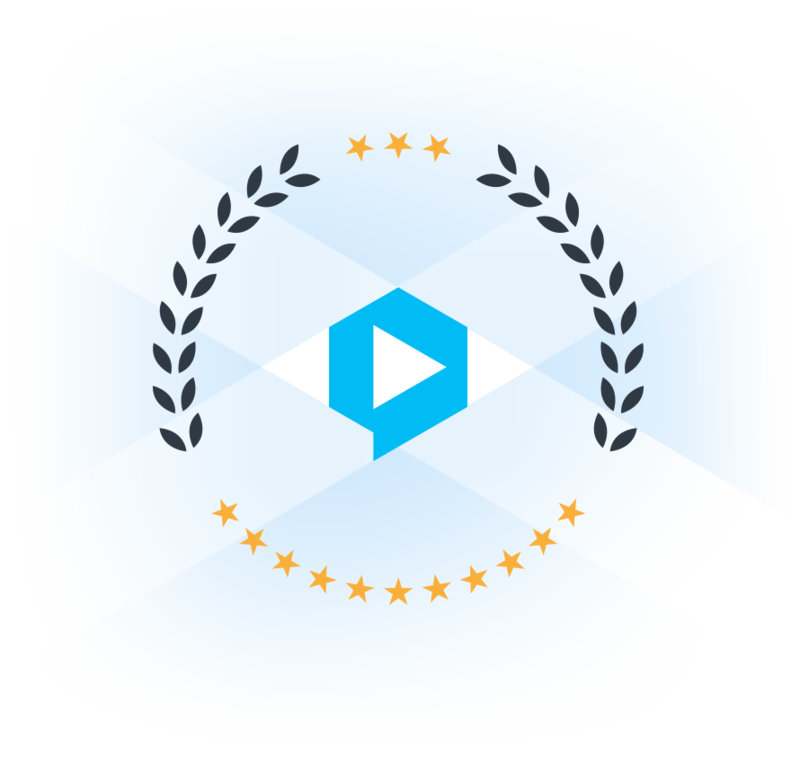 Chatroll can be used with most major third-party video platforms.  With Chatroll, you can leverage your existing video platform experience, or experiment with new video sources. 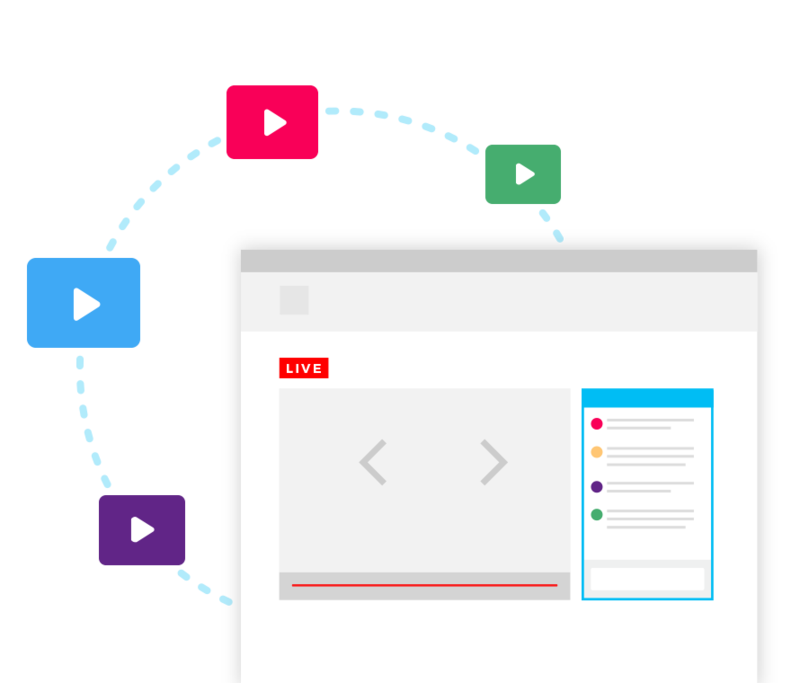 Chatroll gives you the flexibility and confidence to build the best experience for your audience, without the risk of being limited to a single video option. Using Chatroll as the foundation for your live events is a smart and future-proof strategy. Use YouTube Live video with your Chatroll events. Use Facebook Live video with your Chatroll events. Use Brightcove Live video with your Chatroll events. Use Twitch video with your Chatroll events. Tailor Chatroll to perfectly match your brand. Chatroll lets you customize your event's look and feel to create the perfect experience. Change your event's appearance, layout, and behavior with just a few clicks. For a complete branded experience, use the power of Chatroll's Custom CSS to create unique events that perfectly match your brand. Change your event's appearance and layout with just a few clicks. Fully customize Chatroll's look and feel using your own provided CSS. Change the position of the chat user list, or remove it completely. Enable or disable audio notifications for incoming and outgoing messages. Select a time frame to display recent messages to audience members who access your event. Show new messages at the bottom or top of the chat. Engage with confidence. Chatroll's live event platform is trusted by some of the world's largest brands. Even during the largest or busiest live events, Chatroll gives you a complete set of moderation tools to manage the experience and create a successful event. Don't risk the success of your live events; Chatroll keeps you in full control to ensure your audience has an outstanding experience. Moderators can open or close the chat in real-time. Choose how quickly messages appear, to slow down or speed up the conversation. Decide which words aren't appropriate for your event - the filter screens words in real-time. Choose a welcome message that scrolls out of view as new messages are posted. Display persistent messages at the top of the chat for all audience members to see. Delete messages after they are posted. Audience members can be blocked at any time, and you decide if they're allowed back. Send private messages to individuals to assist with moderation. Choose which actions your audience can perform, such as accessing chat history and posting links. Communicate on a personal level, even during the biggest events. 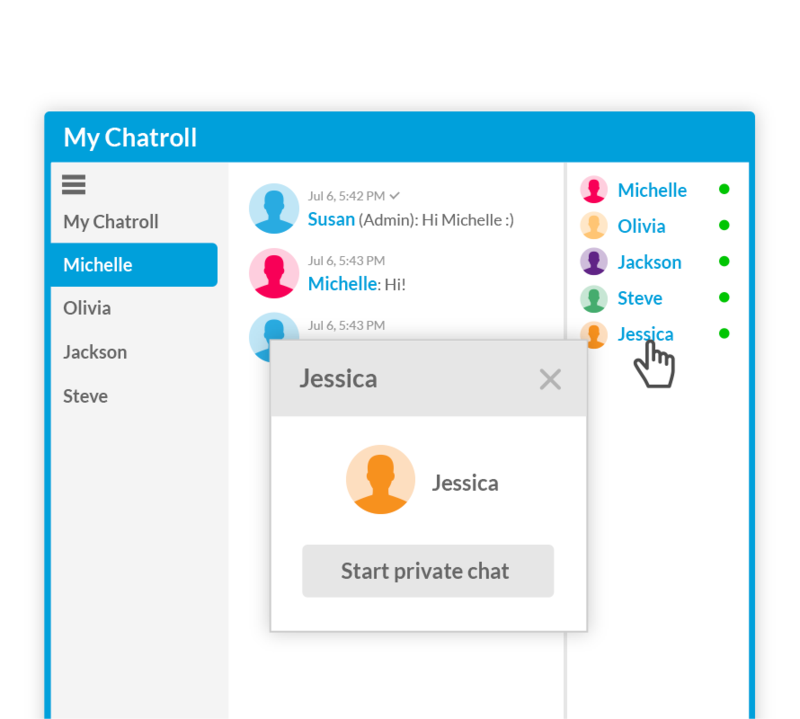 Chatroll lets you create private one-on-one or group "break-out" conversations at any time. An intuitive interface is integrated directly into the public event chat, giving you a fast and convenient way to switch between conversations. Direct messaging makes it easy to ask questions, follow up with specific users, or simply connect on a more personal level. Create engaging Q&A sessions. Turn on Chatroll's powerful Q&A Mode to capture all questions and messages in a moderation queue. By capturing all questions before they go live to your audience, you are always in control of the discussion. Moderators can collaboratively review and select the best questions to get answered publicly.  Chatroll makes it easy to review, select and dismiss questions, while keeping your audience involved and fully engaged. Grow your audience in real-time. Chatroll's social promotion engine encourages your audience to share your live event on Facebook and Twitter, encouraging more people to join your event in real-time. Analytics show you how many people shared your event. With event sharing, you can leverage your existing audience to expand your reach and build even greater interest. This is real-time viral promotion at your fingertips. Measure your success in real-time. Chatroll's unique built-in analytics dashboard gives you access to key event metrics, all updated live. 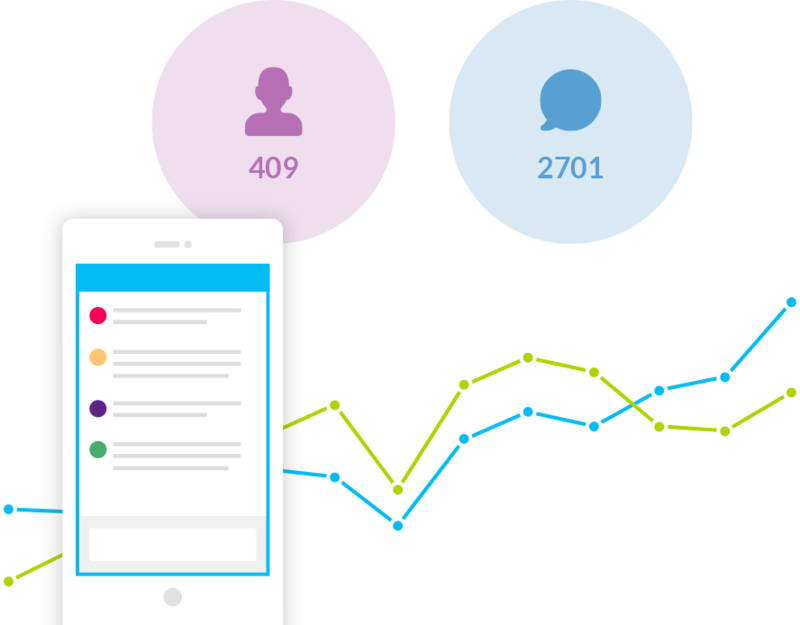 Analytics help you understand the impact of your live events, and even respond to your audience's behavior while your event is happening. The ability to quantify the impact of your live events and gain insights makes Chatroll the ideal core of your live event strategy. The number of audience members who attended the event. The total amount of time your audience spent attending the event. The average amount of time your audience spent attending the event. The number of user sessions during the event. The number of messages posted in the event. The number of messages delivered by Chatroll to your audience. The number of people who joined using each sign-in method. The number of users who actively participated by sending messages. The number of times the social promotion feature was used. Reach and impact a global audience. 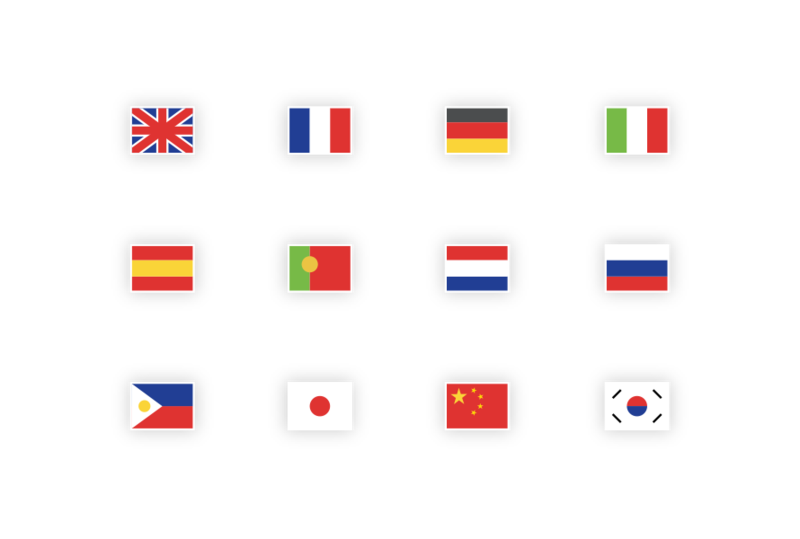 Chatroll's interface is localized in 13 languages, giving you the ability to connect with audiences around the world. The original, trusted platform for live chat events. Handling the massive quantities of real-time data generated by live events isn't easy. Luckily, Chatroll has you covered. Founded in 2007, Chatroll gives you the benefit of nearly a decade of R&D, experience and innovation. Chatroll's real-time technology gives you the confidence knowing Chatroll will grow with you, so you can focus on what you do best. Discover why Chatroll is the live event platform trusted by leading brands worldwide.